You have a garden! So you're lucky ... take advantage of it to make it a warm place both during the day and in the evening. 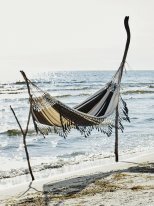 Opt for our garden furniture with, for example, armchairs, chairs, tables, ottomans, mattresses and hammocks. You can also complete your garden furniture with our vases and planters but also our range of decorative accessories for the garden without forgetting our wall fountains.